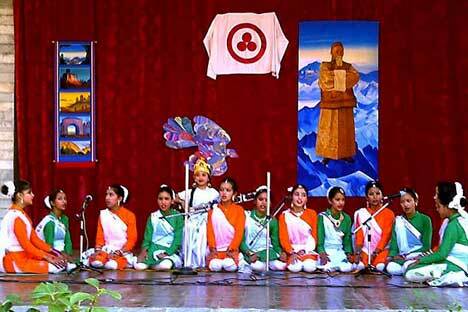 India’s beautiful Kullu Valley, which houses the Roerich family estate in Naggar, hosted a Russo-Indian cultural festival on October 9-15. A varied program dedicated to the 139th anniversary of the birth of Nicholas Roerich and the 85th anniversary of the founding of the Urusvati Himalayan Research Institute was presented to local residents and a great number of Indian, Russian and international visitors. The program included the opening of a new section in the museum complex of the estate, telling the story of how a chemical laboratory was built in the institute. Of keen interest to the visitors was a unique exhibition by the artist-weaver Viswanathan Nair, who reproduced scenes of famous paintings by Nicholas Roerich using traditional methods of weaving on hand looms. Another special event was the arrival of the Himalayan Expedition’s participants from Russia. The annual expedition was organised for the fifth time in a row by the Dostoyaniye Interregional Public Organization. This year, the core of the creative “special mission,” presenting Russian art within the framework of this project, was carried out by participants of the Sibirskiye Uzory youth dance group from Novosibirsk. Their first performance took place on October 14, when hundreds of people gathered for the colorful celebration of Dussehra in the city of Kullu. The audience that filled the huge Kala Kendra Amphitheater warmly received the Russians, who won over the audience by their perfectly honed skills. The concert included several stirring folk dances, original choreographic compositions and lyrical numbers. The next day, the audience applauded the Sibirskiye Uzory in the summer theater of the museum complex in Naggar, which has been run by the Russian-Indian International Roerich Memorial Trust (IRMT) for over 20 years now. The program of the Russian ensemble was wonderfully complemented by students of the Helena Roerich College of Arts of the IRMT, who performed colorful Indian classical and folk dances. A special surprise was the song Pchelochka Zlataya (Little Golden Bee), performed in Russian by the youngest group. The Russian ambassador was particularly happy that a Siberian group arrived in Kullu for Dussehra. “This year, we are delighted to show at the festivities of Kullu Valley’s Dussehra, the performance of young Russian dancers from Siberia, much beloved by the Roerichs, the very heart of my country and to present to you a glimpse at our multifaceted dance art,” Kadakin said. Addressing the gathering, the chief guest at the celebration, Minister-Counsellor of the Embassy of Russia in India Dennis Alipov, said that the Russian side would continue to promote the development of the IRMT. “We expect that the central Indian authorities will play a more active role in these matters as well,” he added. The exhibition hall of the IRMT presented an exposition of paintings and drawings brought to India as part of a program titled “From the Rhythm of Time to the Treasures of Space”, which has been implemented by Dostoyaniye over a number of years. The collection includes works of young artists – winners of competitions held in 2012–2013.